We live in a world of information overload. Fresh data hits us from every direction. All the time. Around the clock. News. Ads. Alerts. Warnings. Updates. You’re drowning under the deluge. Worse, you are being exposed to a lot of toxic information. Open the newspaper or watch TV and you’ll get a non-stop torrent of bad news. Violence. Unfairness. Crime. Crises. Death. It’s enough to depress any healthy person. That’s why you should learn how to filter your inputs. Control what makes it onto your mental radar screen. Famous motivational guru Zig Ziglar likens it to dumping trash into your mind… which leads to “stinkin’ thinking”. Anyway… you’re swamped under information. And to succeed, you’ve got to stem the flow and turn the tide of data in your favor. Fortunately, technology offers us many solutions to help. For instance, you can use Google Alerts to set up news feeds on specific topics and keywords – and the fresh tidbits related to it are delivered into your email inbox. Everything else can be ignored. On Facebook, you might use a Chrome browser plugin that blocks your Wall feed – so that you can only view notifications from specific people in your network. The rest is blocked. You can carefully curate the websites, news services, books, newspapers and magazines that you read or follow. All of this ensures that you get information about things that really matter – without receiving unnecessary, disturbing or distracting updates. This process of filtering inputs is not a ‘set and forget’ action. It’s an ongoing activity. You critically review and revise your choices periodically. Assess the information that makes it through to you. Filter out the sources that are useless. Add fresh ones that are valuable. Within a very short time, you’ll notice a significant impact on your available time, your state of mind and your productivity. Take a similar approach to your email inbox, What’sApp groups, Facebook contacts, Twitter followers and other social engagement. Weed out the wasteful, harmful and depressing stuff. Then watch your energy levels spike and soar! What do you do when you wake up every morning? If you’re like most normal people, you’ll go through a (kind of) fixed routine. It may vary in details, but broadly it’s something to help you freshen up, get dressed, eat and begin work. The reason you follow this every morning, day after day, year after year is because it works for you! That’s the power of a ritual. And by harnessing the power of rituals, you can get more things done – and do them more efficiently. Let’s say you’re a news junkie and want to keep up with what’s happening in your world every day. You could randomly chase after headlines, visit different websites, read the newspaper and listen to the morning news as you drive to work. Or you could establish a ritual… a sequence of steps you’ll follow in the same order to get similar results. Then, each morning you’ll do this – and ONLY this – to feed your news addiction. And you will set a strict time limit for it. Maybe 10 minutes. Or thirty. Your choice. It makes you more efficient. And it frees up your time outside this period – see how to focus on other things without any distraction. The great news is that you can establish rituals for ANYTHING. A set of marketing activities for your online business, maybe. Or to handle your daily email. Or to plan your day’s activities. Or workout at the gym. And they constantly refine and improve these rituals, so that their efficiency increases. To put it simply, a ritual is a series of steps that you’ll take without having to think about them… in order to achieve an goal, or accomplish a task. Just think about that popular aphorism for a while. To make meaningful, steady progress towards anything, you must first know what it is. In other words, you must set goals. Your goals may be big or small. They may be life-defining or modest. They may be short-term or life-long. But time and again, research has proven that goal setting helps fuel performance. There’s an art to setting goals correctly. Too often, people get into goal setting mode around New Year’s day. They make resolutions, which are promptly forgotten within a few weeks. One is little more than a feeble wish. The other carries within it the seed of an action plan. Like rituals, winners set many goals. They also act on those goals with focus, dedication and determination. The reason why goals work so powerfully to boost productivity is that they serve as a focal point around which everything else revolves. All of this is done in the context of goals you’ve set yourself. These goals may be diverse. 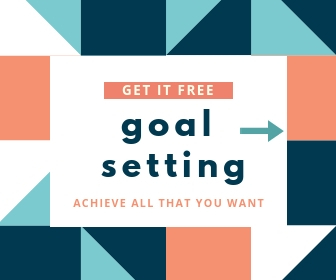 Most goal setting is done in three areas of your life – finances, relationships and health. But there are also several other things for which you can set goals. One thing you want to be famous for. One thing you’d like to be an expert at. One thing you’re most passionate about. Think about what it is for you. And then, practice doing it daily. For me, that “one thing” is writing. For more than 15 years now, I’ve written something every day. Very rarely have I written less than 1,000 words in a day. 1,000 words x 365 days a year x 15 years = 5.47 MILLION words. I still practice writing. Because I love to write. And I want to get better at it. You see, it isn’t enough to just “practice” to get perfect. Your practice should be INTENTIONAL. Take playing golf as an example. You practice your swing. You hit the ball 50 yards down the green. If you keep repeating this through “practice”, you won’t get much better at golf – even if you do it religiously every day, for several years. To improve your game, your practice must be intentional. The intention is to keep getting better. So if your swing this week is 50 yards, then next week your goal should be to hit the ball MORE than 50 yards. Maybe 60. Or if you’re shooting hoops at basketball, and start out sinking one shot out of every 10, the next week you should aim to sink two in 10. Or if you’re practicing speed typing, and begin with 25 words per minute, your next goal should be to top that – with 35 or 45 words per minute. And then, your intention should be to get better quality, as well. So your future golf swing should not only hit the ball further – it should be closer to the hole, or stay more on track than go wide. Your future basketball shots should not only score more often – they should do it from further away, or from a more difficult angle. Your typewriting should not only get faster – you should make fewer spelling mistakes at the same time. It only happens with intention. You might have heard about the 1,000 hour rule… To become an expert at something, you need to practice it for 1,000 hours. Well, only if each of those 1,000 hours was INTENTIONAL practice. Otherwise, you’ll only be repeating mistakes! So figure out your ONE thing. Do it daily. And do it with the intention of getting better at it. In a few years from now, you’ll become a REAL expert. So, you have a goal. You know that it takes action to reach your goal. And of the many action steps necessary, a few are more important than the rest. Make it a habit to execute one of those important steps EVERY day. Maybe you run an online business. There are myriad tasks you’ll handle. Processing orders. Customer service. Product creation. Creating sales processes. Administrative tasks. Accounting. But when you think about it, one set of activities is more important than them all. Because without a steady flow of new customers, your business will stagnate, and eventually die. Even if you do all the other tasks brilliantly! So logically, it follows that you must concentrate on marketing. Yet, for most online entrepreneurs, it’s hard to find enough time for marketing… because their heavy load of work, dealing with other things, is too much. That’s the reason why you should PRIORITIZE correctly. And carve out time for the more important tasks that are essential to achieve your goal. Do it first, before you get stuck in other routines. And do it without fail. Refuse to accept any excuses or arguments to justify not doing it. Don’t go to sleep without getting it done. In a provocatively titled book called “Eat That Frog” (read it here), bestselling author Brian Tracy details the importance of doing “first things first”. It’s revolting to think about eating a frog. But if you have to do it, then focus on doing that first and get it out of the way. The rest of your day will be better! Doing the most important things first works like that. When you use up your available time, energy and resources on doing the tasks that appear urgent or convenient or easier, you’ll realize (too late!) that there isn’t enough left to tackle the more critical activities. That’s why, when you draw up your daily “to do list”, you should place the most important tasks right at the top. Because, caught up in the thick of things, it’s difficult to decide on the fly which things are important – and which ones aren’t. You should make that choice ahead of time. If you don’t work with daily to-do lists, start making it a habit right now. My short and simple guide to getting things done will help you get going. Once you make a habit of doing your most important task (or top 3 tasks) daily, your productivity will sky-rocket. And, surprisingly, you’ll not work any harder than before. In fact, you may well discover that you have a lot more time to spare! Zig Ziglar advises that you develop an attitude of gratitude – as an antidote to stinkin’ thinking! My dear friends Barb Ling and Ken McArthur make it a practice to regularly post a ‘Thank you’ message on Facebook – on which they’ll tag dozens of friends and people they are grateful for. You could do that, too. It’s quick, easy. And here’s how it helps. Our media today creates shell-shock. Whether you’re watching a TV channel or radio program, following a podcast or news website, hearing a late-night talk show or a pundit on her blog, the outlook is bleak and dismal. Markets are collapsing – or about to. Terror attacks are happening – or threaten to. Accidents, attacks, violence occur every day. And the commentary is constantly negative. The problem with this is that your energy levels sink. You lose motivation. You wonder if anything is worth doing at all. You need an antidote to that oppressive feeling – and GRATITUDE works nicely. When you make an effort to be grateful, you’ll start looking for stuff to be grateful about. Look, I don’t care how many problems, worries or woes you have in life… there’s surely a few things you are thankful to have. Sometimes, it’s hard to remember them – unless you try. It could be the smile of a barista who handed you a cup of java this morning. Or the memory of a dad hugging his little girl before she ran off into school. Or the thought of the young man who helped an old lady cross the street. Clear up some time on your schedule to be grateful. I do this late at night, before going to sleep. I think about my day, and my life. I try and recall a person, event or thing that I’m happy to have in it. Then, I hold the thought of that in my mind for a few minutes before drifting off to sleep. You can choose a different time of the day. You can pick another approach to choose what to be grateful for. You can decide how you’re going to express your gratitude. What matters most is that you consciously seek out things you’re thankful about. Because doing that shifts your mindset in a positive direction. Suddenly, things start looking brighter. You’re energized. Your focus grows sharper. You feel more alive. And suddenly, life’s worth living, right? Now, if I told you that health, wealth and success will be yours only if you did this 5-minute thing over and over every day for a full year, would you still do it? Because the reward is well worth the price. Which means the only reason you’re not already doing it is because you don’t know how powerful these things are. I’m going to tell you, now. And then, it’s up to you to decide whether or not to do them – and keep doing them. None of them is costly. It’ll probably take you 5 minutes a day. Any fruit is ok. So pick your favorite. An apple a day keeps the doctor away. Eating a piece of fruit every day has incredible health and nutrition benefits. Choose fruits you like and will enjoy eating, this even becomes fun. A glass or two of water, three times a day, will refresh, energize and nourish you. Just regular water. No ‘shine’ or ‘sparkle’ or ‘aeration’ needed. Many people are dehydrated – and don’t even realize it. Drinking water cures that – and will boost your performance. Take a multi-vitamin pill once a day. No matter your age or health status, your body needs a daily quota of vitamins. If you don’t get it in your regular diet, you can take it as a supplement. Make sure you get your daily recommended allowance and watch your health soar. An extra hour of restful sleep can transform you into an energetic dynamo. Go to bed a little earlier. Avoid sedatives and sleeping pills. Take short 15-20 minute ‘power naps’ in the middle of the day, if you feel very tired. It will refresh you and leave you with more energy to face the rest of your day – and be much more productive. No, not lengthy workouts in a gym. They help, but if you can’t squeeze one into your busy day, I totally understand. But at least do some simple stretches, yoga routines or mini-workouts for a few minutes daily. You can see my 15 minute plan: go here. Now, these are just five ideas. You can follow them all. Or only a few. Or even none. That isn’t the main point I’m trying to make. It’s that you should develop good habits. All kinds of good habits. Habits that you follow constantly, regularly and without fail. Because success takes consistent and directed effort. Habits help you achieve such effort. In an upcoming book, I’m going to get deeper into the topic of developing positive habits. If you’d like to read it when it’s done, let me know by clicking here to pre-order your copy. Many of us have a skewed idea of what success means. Often, we define it in terms of money earned, assets owned, or possessions bought. The owner of a $25 million company is deemed successful – even if he ruins his health and lacks a meaningful relationship with his family, as a consequence of working so hard to achieve his “success”. Because, in the overall view of life, we can’t do with financial success alone. We also need success in our health and relationships. Success only makes sense if it’s worth achieving. And many of us want to succeed FOR the people we love. So, why is it that while we pursue success, we ignore those same people? All it takes is a few minutes every day to communicate with the special folks in our lives. A chat over a cup of tea. A conversation on an evening stroll. A phone call at the end of a busy day. Surely that’s within anybody’s reach? Yet, strangely, many entrepreneurs don’t value this inter-personal connection highly enough – until it’s too late. Only when relationships break down and bonds are strained to the breaking point do they wake up and realize how vital it is to their “success”. Avoid getting into this bind. Make it a point to talk every day to the people you love. The special men and women, boys and girls, spouses and partners in your life. They are who make everything else you do meaningful. And as you sweat and struggle to attain success (however you may define it), take the time to nurture your relationships with these wonderful people. Make time to meet them as often as you can. Take the effort to reach out to interact with them. So… should you stop working hard? No. Because success doesn’t fall into anyone’s lap without hard work. But take time out of your busy schedule to talk to the people you love. You’ve listened patiently to me as I recommended getting more sleep, talking to people you love, being grateful… while all the time, your competitors are slaving away to get ahead. If you waste so much time doing all of this, how are you ever going to catch up to them? Well, here’s a huge surprise. You can outperform anyone even while working less than them – if you sharpen your focus. Here’s a shocking fact. The average CEO of an American corporation only manages around 20 minutes of focused work in a typical day. That’s right. Less than half an hour daily! The rest of their time is spent fighting fires, meeting with people, and tackling administrative trivia. So if a FORTUNE 500 company can be effectively managed by a boss in just half an hour daily, what’s the secret? If you’re able to concentrate totally on any task you’re engaged upon, your productivity will go up by 100% to 450% – easily. That’s why it is important to learn how to tune out distractions, overcome procrastination, and get things done. One of my best-selling ebooks is “How To Focus” – and if you grab your copy here for less than five bucks, it will help you get started with improving your concentration and getting things done. Of course, you can get even higher value from the full-blown 6 week personal transformation program, TRANSFORM-37 – learn more about it here. How does it help to be more focused? You won’t get distracted, so your efficiency will be higher. You’ll devote more attention to any task, and get it done faster. You’re going to see new opportunities, and spot errors more effectively. You’ll have more time to tackle many more projects and tasks. In the end, you’ll get more done with less effort – and still have extra time left over for other things that matter. That’s a nice position to be in, don’t you agree? Learning to focus better is like having 27 hours in a day!